In Greek mythology, Ares is the son of Zeus and Hera. Though often referred to as the Olympian god of war, he is more accurately the god of savage war, or bloodlust, or slaughter personified. Among the Greeks Ares was always distrusted and although Ares' half-sister Athena was also considered to be a war deity, Athena's stance was that of strategic warfare while Ares' tended to be the unpredictable violence of war. His birthplace and true home was placed far off, among the barbarous and warlike Thracians, to whom he withdrew after he was discovered on a couch with Aphrodite. The myth says that the Sun-God Helios once spied Ares and Aphrodite enjoying each other secretly in the hall of Hephaestus and he promptly reported the incident to Aphrodite's Olympian consort. 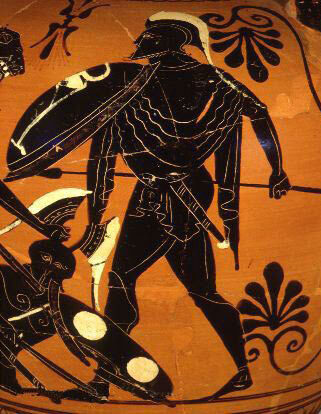 Hephaestus contrived to catch the couple in the act, and so he fashioned a net with which to snare the illicit lovers. At the appropriate time, this net was sprung and trapped Ares and Aphrodite in a very private moment. But Hephaestus was not yet satisfied with his revenge - he invited the Olympian gods and goddesses to view the unfortunate pair. For the sake of modesty, the goddesses demurred, but the male gods went to witness the sight. Some commented on the beauty of Aphrodite, others remarked that they would eagerly trade places with Ares, but all mocked the two. Once the couple were loosed, Ares, embarrassed, sped away to his homeland, Thrace. Ares had put the youth Alectryon by his door to warn them of Helios' arrival but Alectryon fell asleep so Helios discovered the two and alerted Hephaestus. Ares was so furious that he turned Alectryon into a rooster, which now never forgets to announce the arrival of the sun in the morning. Ares had many different children with different goddesses and other women. Some of his children were Harmonia, Fovos, Remus, Romulus, Diomedes and Cycnus of Macedonia who was so murderous that he attempted to build a temple with the skulls and the bones of travelers. Heracles slaughtered this abominable monstrosity.